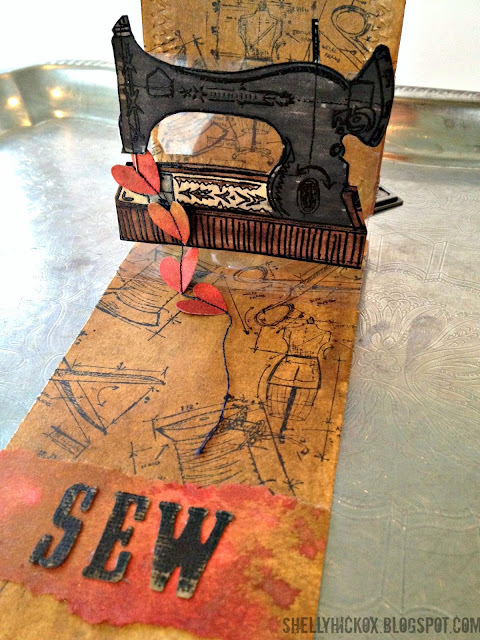 Tomorrow and Saturday I'll be teaching a Pop 'n Cuts Card Class at Scrapfest in Covington, Louisiana. Recommended: print out photos of these cards to refer to during class. You will receive small color photos on your handouts, but full-size photos would be even better! Hurray! The Accordion Album and the Frame & Label dies are back in stock at many local and online retailers! Today I'm sharing a fun folding technique to make the Accordion Album double-high. I fell in love with the new Basic Grey Knee Highs collection for its fun colors and super cute birds! A doublehigh album would be great for photos, but I wanted to make a Thank-you card for a friend, so I decorated this one with papers and embellishments. When the album is closed, it measures 5" wide by 7" tall, which will fit in an A7 sized envelope. Because my Tattered Floral rosettes are so bulky, though, it would need extra postage. If I had stuck with flat embellishments it could be mailed for one stamp. I love the way my Bigz Fancy Frame die works with the Accordion Album. It overhangs the sides just enough to make it interesting! The "thanks" is a Paper Smooches stamp. The birds paper was so cute that I fussy cut one of the birds, highlighted the face with some Copic shading, added Glossy Accents to the eyeballs, and layered it along with my Label & Ribbon Movers & Shapers set. When I saw that Tim Holtz was running a Tattered Florals challenge, I just knew I wanted to play along! I decided to make rosettes from the Tattered Florals die. The first step in creating a double-high album is deciding where to put the fold. I knew I wanted a 7" high album, so I measured 3.5" from the bottom cut blade of the die, marked a pencil line, and then aligned my folded paper with that line to die cut. If you arranged the fold somewhere in the outer frame of the die you will end up with two stacked albums, which is also a fun look. Experiment! 3. Unfold after die cutting to reveal a doublehigh page. 4. Use a strong adhesive to attach the pages together using the long side tabs. Assembling the doublehigh album is just like normal. Use a strong adhesive to attach the pages together with the long side tabs. Cut off the final side tab since there is nothing to connect it to. 5. The Frame & Label die can be used the same way. Mark a line 3.5" from the bottom blade. 6. Align the fold of the decorator paper on the line. Before attaching the inner frames to each other, use the Frame & Label, Bracket die to cut some decorator pieces. Since this die is designed to perfectly fit the Accordion Album, it's easy to do the same process with a pencil line 3.5" from the bottom blade and aligning the fold of the paper on that line. 7. By doubling the Frame & Label Bracket die, all the decorator pieces will fit the tall album perfectly. There will be a fold in the middle of every decorator piece, but I've noticed that patterned papers tend to mask the line much better than cardstocks. Papers with busy patterns are the best. However, you can always cover the creases with embellishments and photos. 8. After adding decorator papers, use the small tabs to connect the inner panels so they travel right through the center of the accordion-folded outer frames. See? It's super easy to make a doublehigh Accordion Album! Now let's talk about the Tattered Floral rosettes. 1. Cut two tattered florals and snip to the center between any two petals. 2. Pinch mountain folds in the center of every petal. 3. Bring each mountain fold to its neighbor, creating a valley fold between the two petals. Continue around the flower. After cutting the slit to the center, it's actually quite easy to just work your way around the flower, pinching a mountain fold in the center of each petal. There is absolutely no need to score first and perfection is highly overrated. Just pinch in the approximate center. Now bring each mountain fold over to its neighbor, creating a valley fold between the two petals. Again, no measuring, no scoring, no stressing! 4. Repeat the process to make a second half-rosette. 5. Snip off one half of the outermost petal from each half-rosette and use adhesive to attach them to each other. After the really fun carefree pinching you'll have a half-rosette. Repeat the process (Wheee!) to make a second half-rosette. Snip off half the outermost petal (right along the mountain fold) on one side of the half-rosette. Do the same thing with the second half-rosette and then adhere them to each other with tape runner or glue. I layered a large rosette with a medium one, added a small tattered floral and then a painted metal Foliage flower. I used the brad to attach the finished rosette to the album page so I didn't have to worry about glue. I used various size Tattered Floral rosettes throughout my album. Fun and easy! So how about it? Ready to give either or both of these techniques a try? I'd love to see what you can come up with! I was a last minute addition to the current UStamp with Dawn and Friends online event, Grow Creative Love as a guest designer. If you want access to the supply list, PDF instruction sheet and private video tutorial for this project you would need to go to UStamp with Dawn and Friends to purchase access. I can't remember exactly how many projects were posted by the amazing designers Dawn has assembled, but it was a lot! I've been invited to guest design at a future UStamp event this year, so I'll post the particulars when I know more. Heading to California tomorrow and will be teaching all day at Stampers Corner on Saturday. The classes are sold out but there is a free demo from 1:00-2:00 pm if you want to stop by and see Pop 'n Cuts dies in action. Pop[up] Spotted: Throw me somethin', Mister! Happy Mardi Gras! I'm celebrating by listening to The Neville Brothers and wishing for King Cake! I'm looking forward to my upcoming trip to The Big Easy to teach at Scrapfest. The cards will be the same three cards as next week's Stamper's Corner trip, but not the chair card. We're not doing pre-orders in Louisiana because we're coming from out-of-state. So the fourth card will be a simple card using the Sizzix Pop 'n Cuts Base Die w/Circle Label insert. All of the dies I use in class will be available for sale at the Scrapp'n Savvy booth. A couple more classes to announce and then it's on to the spots. I will be teaching at the Collins Spring Retailer Training Event in Framingham, Massachussets April 20-21, 2013. In early May I will be teaching at Scrapbook 'n Such's NSD event in Wichita Falls, TX. To support my Stampin' Up! exclusive dies you'll find me posting SU ideas, templates and videos here on my blog, plus teaching online for UStamp with Dawn & Friends. You might also want to follow the Sizzix+Stampin' Up! Pinterest board. The theme for today is definitely Love and Puns! 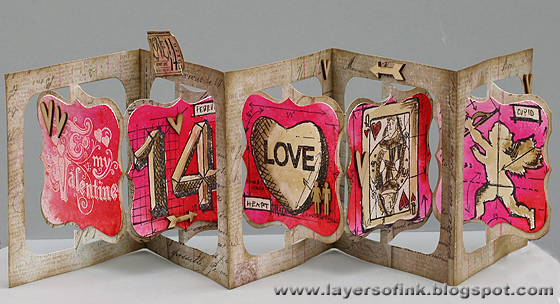 Gretchen has an adorable card on her blog featuring the Bigz Circle Platform w/Ribbons die. A video for this die is still on my to-do list, so I especially appreciate Gretchen's step-by-step picture tutorial for assembling it. It's an easy one, very generic, and you can always add bigger items on top of the circle to change out the look. Kelly Booth! What can I say about mad talent and Copic skills that turn me YG17 Grass Green with envy?! Here she's combined the Sizzix Pop 'n Cuts Base Die with the Love insert and companion Love Sizzlits set for a perfect shadow. Then, with a brushstroke of pure genius, she added the Bigz Scalloped Circle pop-up die to the shelf area above the Pop 'n Cuts and gave herself two more tiers for pop-ups! Speaking of clever combinations of dies, let's hop across the ocean to check in with Helen Cryer, who posted this beauty combining the Sizzix Pop 'n Cuts Base Die with the Label Insert and the word "Love" from the Love Sizzlits set. And then, most brilliantly, she added a Flagpole with a hidden folded foot and used the banners (bunting) to pull it up when the card opens! SO SMART! Definitely will be trying this. Through our mutual love of papercrafting I have become friends with so many amazing designers. One of my newest friends, but I already feel like I've known her for forever, is Fran Sabad. Fran is a Stampin' Up! demonstrator from Lexington, Kentucky who is posting masterpiece after masterpiece of Pop 'n Cuts creations on her blog. Here is just a taste of her work. She's combined the Stampin' Up! Exclusive Pop 'n Cuts Card Base with the Sizzix Flowers Pop 'n Cuts Insert for this super cute Happy Bee-day card! Let's scoot on up to Alaska and check out the clever adaptation of the Stampin Up Exclusive Card Base plus Dress Form Pop 'n Cuts Insert from Sue Erickson. Sue removed the top of the dress form and the table legs, and then, by fashioning a doily tablecloth, the base of the dress form looks like fancy table legs! How very, very clever! Since I really want to be in the company of these fine designers, I'm going to spot my own post! From this very blog! (I know! Cheeky!) I posted my Queen of Hearts card, video tutorial and free template this weekend and in case you missed it, either scroll down one post or click the photo below to check it out! Clicking through these blogs and soaking up some inspiration is a fun way to celebrate Mardi Gras! With all of Stampin' Up! 's stamp sets there are endless combinations of cute items waiting to be animated with a Floating Floor! Since I didn't want to hide any of the dress form to support the floor, I drafted a template to build the floor underneath the Pop 'n Cuts piece. PRINTING NOTE - with PDFs, your printer may default to "shrink to fit" or something similar. When you send the file to print, just take a look-see and make sure it says "no shrinking" or "no page scaling" or "scale=100%" or "print full size" - however your printer likes to say it. If you're printing templates for a class, then you print ONE first, take out your ruler, check that the width is 4.25", and then print the rest. Here are some photos of the Queen of Hearts card that I make in the video. For the front of my Queen of Hearts card, I used the new Honeycomb Textured Impressions folder, some bakers twine and a single stamped heart. Inside the card I've fashioned a Queen of Hearts dress from the Dress Up Framelits and used stamped & colored hearts popping up throughout the floating floor. I used all Stampin' Up! products on my card. Interested in the dies used for this card? You can click on the images below to go to the SU website and find a demonstrator in your area. I highly recommend supporting your local demonstrators - they offer so much valuable education, ideas and customer service! In case you haven't seen it, here is video tutorial for these three dies. Hello California! Did you know that the time difference between Elk Grove and Houston is actually a week? So it's February 1st here! What? Not buying it? Ha ha. OK, a mere week later than promised, I'm posting the cards for the February 23rd class at Stamper's Corner. We're going to do three "amped up" Pop 'n Cuts cards with dies that are available now (and you can purchase after class) and then one bonus card using dies from the new Journey collection, and you can pre-order those dies. The first "amped up" card will be the Star birthday card, showing how to use the "stand-up" Pop 'n Cuts inserts for a horizontal cascading effect. *NOTE* You are always welcome to bring coordinating inks and blending tools to "grunge" up your cards. Typically I show them "clean". Ink colors that would work well for this card would be a medium blue or green. Next up, the Floating Floor for the Frame Pop 'n Cuts insert. For the frame card I used a little Vintage Photo distress ink on the edges - bring brown ink if you like this look. For the final "amped" technique, I decided to make a "Hello" version of my mirror card. This is a fun technique for use with any of the word Pop 'n Cuts inserts. By purposely die cutting the piece backwards and then orienting it upside-down, the word will read correctly when viewed in the mirror, which is suspended into the background of the card. The effect is fun - a "floating" word. For the three cards shown, your kit will have everything pre-cut so we can finish all three cards. I will demonstrate the steps for how I die cut each pop-up and you will receive full supply lists and instructions for recreating the cards. I am sending a set of original cards out to the store for display, so you'll be able to stop in and take a look at them if you're on the fence about signing up. Don't worry if you don't like my color choices - come to learn all the techniques! That's the real take-away of a Pop 'n Cuts class - learning all the tips/tricks for these dies. I had some requests to draft a template of the Tuxedo I used on my Wedding card. You can click on the photo above to see the rest of the Wedding card. Here is a FREE template for a tuxedo to fit the Stampin' Up! Exclusive Dress Form Pop 'n Cuts Insert and/or the Stampin' Up! Exclusive Dress Up Framelits set. This is going to be a great way to use the Stampin' Up! Pop 'n Cuts in a more masculine way. Today I made a Valentine's Day Card for my husband, John. For die cutting, I first cut a strip of cardstock to 4" wide. This is a little trick I often use if I'm starting with 12x12 cardstock. By using 4" strips, I can get three Pop 'n Cuts interior cards from one sheet of cardstock. It only works, though, if you're planning on trimming the ends shorter and using a "full" backing card. With a 4" piece, you won't be able to cut a working closure, so plan on trimming at least an inch from both ends. This trick also gives you a little interior side border, so it looks great when you're using contrasting colors/patterns for your pop-up/backing cards. Next, use Post-it notes to mask off the table and the floor. I also masked off just the top of the dress form. No need to mask the rest of the form because the tuxedo will cover it. To make my wall paneling, I first added strips of thin graphic art tape (office supply store) and then sponged ink and stamped a woodgrain texture. When I peeled up the tape some of the freshly sponged texture peeled up too, but I decided I liked it! To change the color of the table I put a piece of DSP over just the table portion of the die and ran it through the Big Shot. I used scissors to isolate and remove the two halves of the table and then glued them in place. Post-it notes make such great masks and can be used over and over. I masked off the floor and stamped a spotted texture. My general method for adding a Pop 'n Cuts insert card to a backing card is to coat one half with tape runner, then line it up in the fold and press to one half of the backing card. Then I flip the card over, add adhesive to the other half of the pop-up card, and press it to the other half of the backing card. If accuracy is important, move the heart to the left side! All supplies (except rickrack & buttons) Stampin' Up! I would love to see some creations with this template. Demonstrators are welcome to use the template for classes as long as my logo and website stays on the template. The 2013 Stampin' Up! Spring Catalog includes three exclusive dies for the Pop 'n Cuts system. You can click on the images below to go to the SU website and find a demonstrator in your area. I highly recommend supporting your local demonstrators - they offer so much valuable education, ideas and customer service! As promised, here is video tutorial for these three dies. If you're new to Pop 'n Cuts, you might also want to check out my video series of Pop-up 2Torials for additional ideas and techniques for using Pop 'n Cuts. You can adapt the ideas for use with the SU designs. As an example, I used the Doublewide Pop-up 2Torial technique with the Stampin' Up! Pop 'n Cuts dies to make a wedding card. By folding my paper lengthwise before die cutting, I was able to cut a card that is 7" wide but maintains the built-in closure of the Card Base. Inside the card the folding technique resulted in two dress forms! Fun! A Vintage Label stamp with mirrored paper makes a nice backdrop behind the happy couple. I created the tuxedo from black and white cardstock. I printed a photo of a tuxedo from the internet to use as a guide. The dress is the sleeveless Dress Up Framelits, extended to make a full-length dress. This angled view shows the pop-up. I cut pieces of Designer Series paper to cover the "wall" and "floor" of the card. I used a craft knife to remove a rectangle from the papers corresponding to the footprint (and wallprint) of the tables. The rectangles that were removed were then slid under (and behind) the tables so the pattern would continue. To decorate the dress I used a paper flower and snipped all the petals off. I layered the petals at the bottom of the dress and used lace above them and across the top of the dress. The veil is tulle, bunched together with a strip of lace at the top. Here is the video tutorial for making Doublewide Pop 'n Cuts cards. If you want to skip right to the Pop 'n Cuts technique, it starts at about the 3:00 mark. Do the Stampin' Up! Pop 'n Cuts interchange with the Sizzix Pop 'n Cuts? Yes! All Pop 'n Cuts inserts fit in ALL Pop 'n Cuts Bases. Why would I buy the Stampin' Up! Pop 'n Cuts Base instead of the Sizzix Pop 'n Cuts base? Will there be a similar dress form Pop 'n Cuts insert available from Sizzix? No way! I designed that exclusively for Stampin' Up! You can find a local demonstrator using the Find A Demonstrator tool on SU's website. Will there be more inserts available through Stampin' Up! in the future? I hope so! I definitely hope that Pop 'n Cuts are successful with Stampin' Up! so we'll have expansions to the line. How did you get started with Stampin' Up!? Are you a demonstrator? My association with Stampin' Up! is entirely through Sizzix. Sizzix manufactures the dies and machines for Stampin' Up! and I was able, through my relationship with Sizzix, to pitch Pop 'n Cuts to Stampin' Up! My contract is with Sizzix and I am not a demonstrator. However, I have a lot of demonstrator friends and purchase a lot of Stampin' Up! products. My goal with my videos and samples is to provide support to the demonstrators for promoting and educating on these products. Demonstrators are encouraged to use my ideas as sales tools. As much as possible, I try to limit my supplies to only Stampin' Up! when working with SU dies. Some of the SU products I've used are retired, but at least you will get the general idea and can re-make the cards with current product. One last piece of news. I am a guest designer for the current UStamp with Dawn & Friends event. The event just started and you can still get early bird pricing through February 3rd. The projects from all the designers are fabulous and are made entirely with Stampin' Up! product. The focus is on product in the new Spring catalog.